Here's Callie looking back at me on a recent walk. She always wonders if I'm capable of keeping up. I am. But when I've got the camera, I stop too much for her taste. She waits for me, but I know she's just doing it to be polite. She must wonder if I could find my way home without her. Spring is chilly this year. But the plants are coming along, and there are lots of flowers. A good sign? I hope so. The grape vines are starting to get their leaves now. Spring is unfolding in slow motion this year. That's ok, as long as it means that we'll have a nice summer. I don't know why it should mean that, but I'm hoping it does. Blettes in French or silverbeet in the Queen's Aussie English. This is one of six or seven plants that remain of our fall crop; they overwintered in the jardin potager (kitchen garden). They're coming back and should provide us with a couple of decent spring harvests. The leaves are tender and sweet when cooked and the stems are delicious, too. It's best to cook them separately as the stems take a little longer to cook than the leaves. 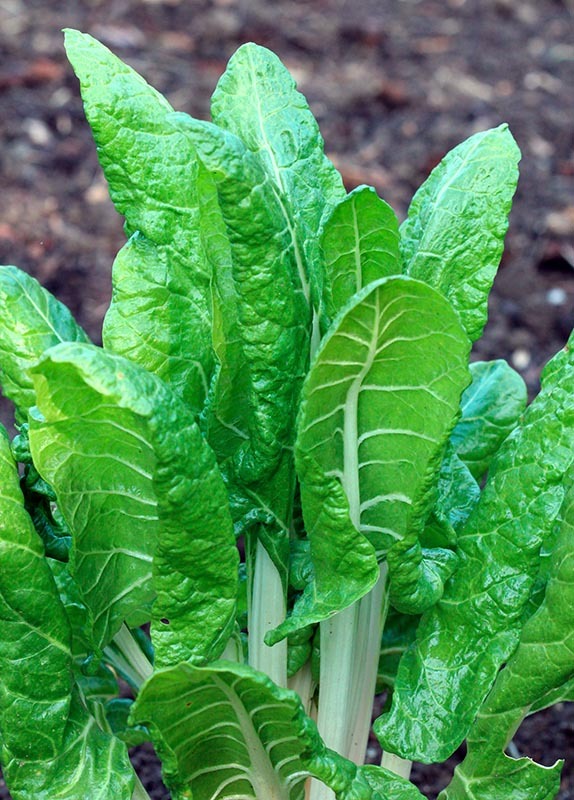 Chard in the spring garden. I've planted a row of sweet peas next to these already. One day soon I'm going to put in a row of curly kale as well. But today, while chilly, is clear and dry and I've got to take advantage of that and get the grass cut again. 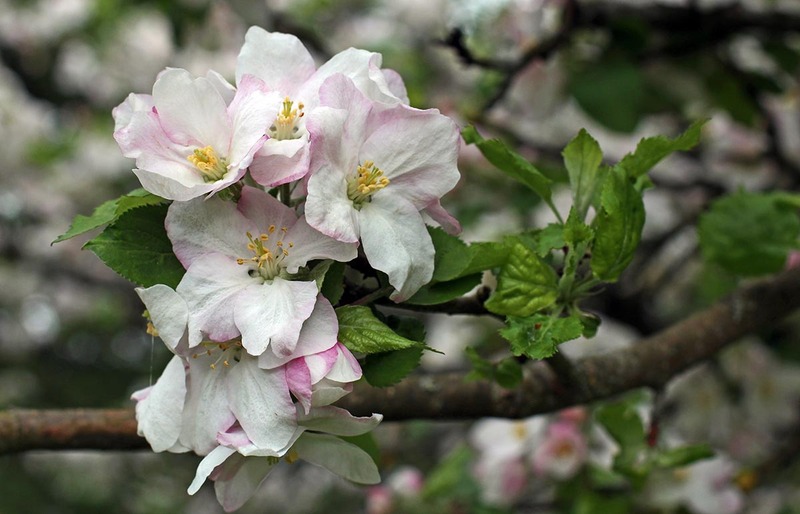 Our apple trees are in flower now. Last year they didn't flower at all, and we had very few apples (almost none). This year looks like it'll be back to thousands of apples. That will need to be picked up off the ground every time I cut the grass. Blossoms on one of our four apple trees. Some will make it into pies, others into apple jelly. Most will go into the compost pile. I've seen a few of these beetles on my daily walks recently. They're hard to miss, being so large and so iridescent. They move quickly, too. It was hard to get a clear shot as he sped along. The shot's a bit blurry as the bug was speeding along quite nimbly over the leaves. 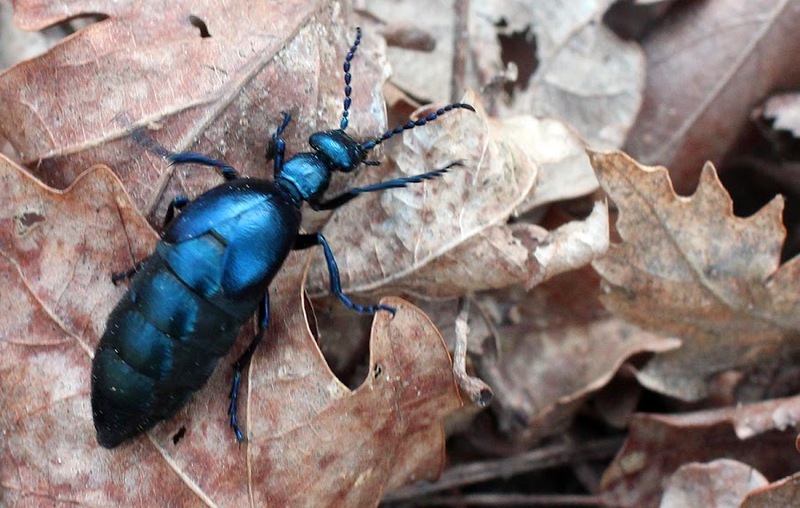 I think this might be a female European oil beetle. Many of you expressed concern about my wine enjoyment in the comments section of the last post. Fear not! I have not yet decided to give up wine altogether. I mean, wine is one of the basic food groups, right? And I live in a vineyard. My triglyceride levels were not that high, after all. But a curious thing happened. When I stopped the wine for two weeks, my sinuses cleared up. I hadn't breathed so freely in over a decade. Then, the day after I started having wine again, my sinuses blocked up and I am now having nasal allergy-like symptoms: runny nose, itching, and sneezing. It could all be a coincidence related to spring pollens in the air as these weather systems bring up nasty stuff from the south. Ken has really been suffering from that lately. Or, in some odd twist of fate, the universe could be telling me that I'm allergic to wine. My doctor wanted me to get my blood analyzed for triglyceride levels because my last annual test showed them to be a little higher than the safe/low risk level. He said that wine was the cause of the high numbers, so I decided not to drink wine for the two weeks before my follow-up analysis to test his theory. He was right. My triglyceride levels plummeted by half and are now well within the normal range. But that's not the best part. While I was at the lab, I noticed a poster on the wall advertising that patients can now get their lab results on line. So I inquired. Sure enough, I got an ID number and a password, and that evening I was able consult and download my results via the internet. That saves me a trip back to the lab to pick them up. Wednesday was beautiful, and today is supposed to be even nicer with a high temperature of 24ºC (about 75ºF). We'll take it. But then Friday and the weekend are predicted to bring rain and une baisse vertigineuse des temperatures (a vertiginous drop in temperature), i.e., it's gonna get cold again. Our laurel hedge is flowering now. We are taking advantage of the nice weather to work outdoors. I got some seeds planted in the garden; they're for early crops like radishes and lettuces and peas, so the cooler temperatures shouldn't hurt them. And we burned our yard waste. We had three piles under tarps all winter and now they're gone. It sure feels good to get something accomplished! I've mentioned before that the vineyard out behind our house is a patchwork of sorts. 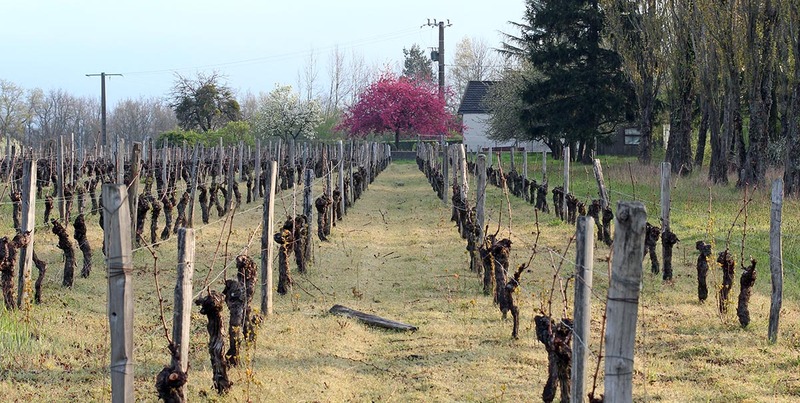 The vines are not all owned by one grower. 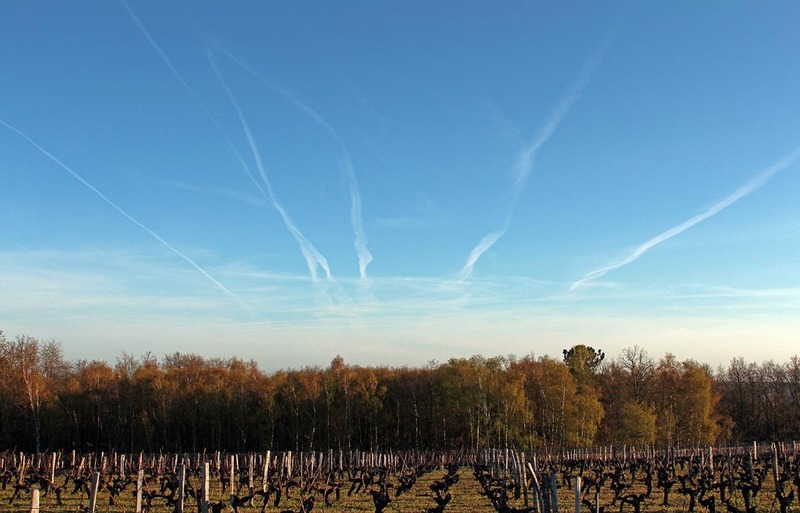 Rather, the seemingly seamless vineyard is a collection of individual parcels owned and tended by many local growers. Some of the growers practice organic or near-organic growing. 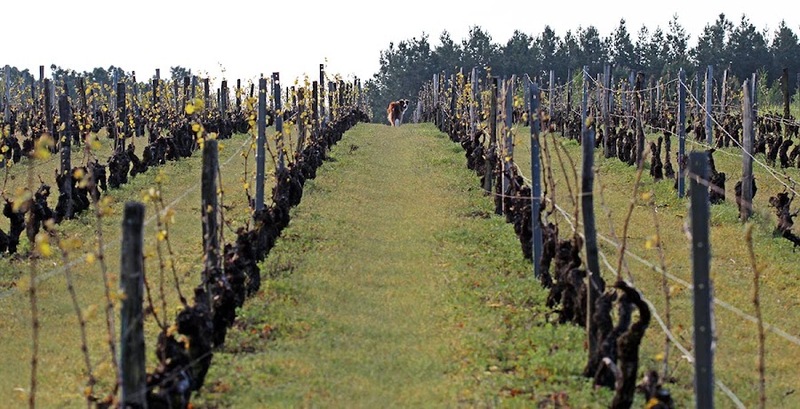 They mow or plow between the rows of vines to keep weeds down. 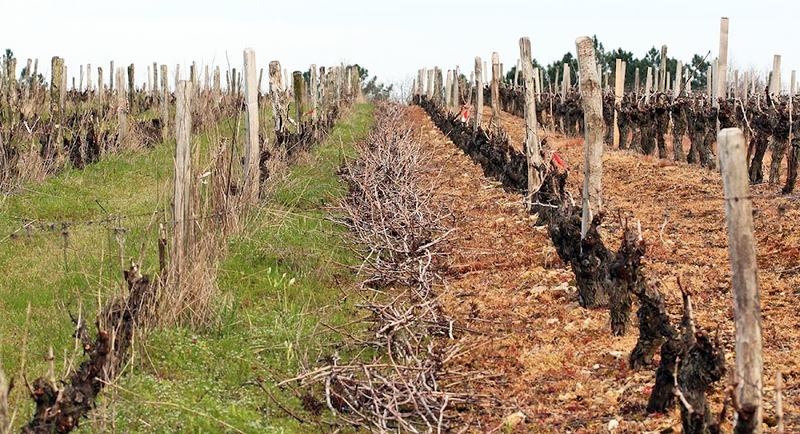 Others use herbicides to kill the grasses and weeds that grow under the vines. You can see the difference in the photo above; the use of herbicide is obvious in the parcel on the right. 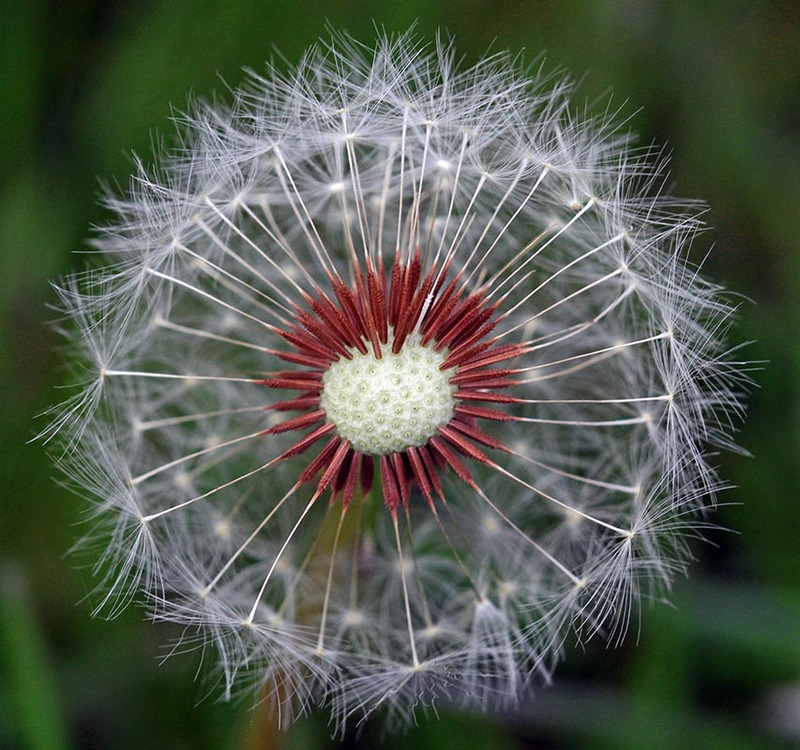 I prefer the parcels that keep their weeds. The grass and wildflowers, in addition to being pretty, provide habitat for the insects and other small critters that live out there. They don't seem to have any detrimental effect on the grapes. While cutting the grass on Monday, I noticed that the concrete barbeque grill was leaning slightly. Backward. Looks like I'll have to take it apart and see if I can re-level it. I moved it to this spot about seven years ago. The grass is nice and green this year because of all the rain we've had. I dug out a foundation and filled it with sand so that it would be stable. Everything shifts over time, I suppose. As it turns out, we don't use this grill much any more. It's pretty far from the kitchen, which is upstairs and on the front side of the house. These days we use the little electric grill on the deck a lot more. I've already used it once this spring. 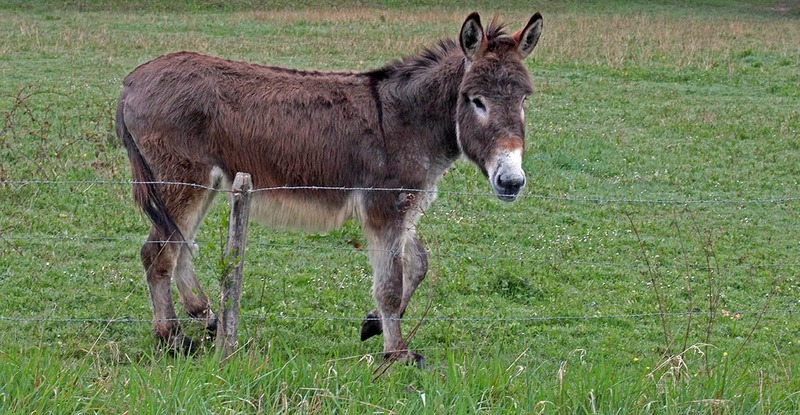 This is one of two donkeys that hang out in the pasture next to the vineyard behind our house. The second one is a recent addition as there was only one for years. We don't know the people who own them as their house is on the next road over. The pasture is across the ravine and through the woods from their back yard. He (or she) came up to fence and let me pet his nose. Callie stayed away. I think the donkeys have a barn or other shelter on the other side of the ravine because they're not always in the pasture. Wherever they are, we can often hear the classic "hee-haw" when they bray. Here we are, one month into spring, and we're complaining about how it's still cold and not summery. We've had a few very nice days, but also some lousy weather. I have a theory: I think we're having a very normal spring. It's just that we're not used to it. Trees in flower around our neighborhood, seen from the vineyard. The past few springs have been unseasonably warm. Last year, March was sunny and warm and beautiful. Then April and May were washouts. We remember the warm and beautiful part, but March is way too early for that kind of weather. In France there are (at least) two sayings about spring. The first is en avril, ne te découvre pas d'un fil; en mai, fais ce qu'il te plaît. Roughly translated, it means "in April, don't remove a stitch of clothing; in May, do what you like." That's an indication that April can be chilly, but May should be nice. The other is not really a saying, but a warning that one should not set plants out in ones garden before les saints de glace (the ice saints' days). The saints in question are Saints Mamert, Pancrace, and Servais whose days are celebrated the 11th, 12th, and 13th of May, respectively. The warning originated in the Middle Ages as a rule of thumb that, until those dates in May, there can still be a crop-damaging freeze. So, I think we're having a normal spring and we just don't realize it. Nor do we like it much. I was lucky on Friday afternoon. I went out for my walk with Callie around 5:30 and, while there were some big puffy clouds in the sky, we had a very nice sunny walk. Not fifteen minutes after we got back a huge thundercloud came over and the wind picked up. 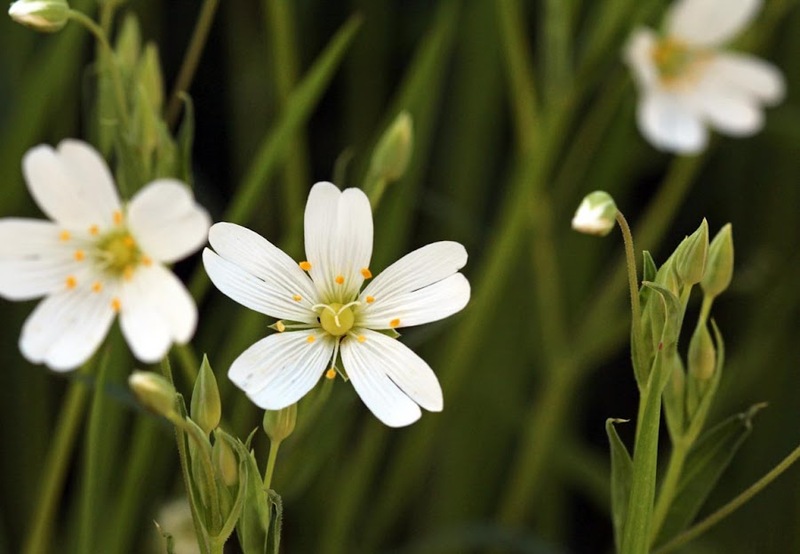 I think this is called céraiste langue d'oiseau (stellaria holostea) in French, bird's tongue in English (thanks, Tim!). We got lightning and thunder, and just a little bit of rain. It was pretty and kind of exciting, but my walk would have been much less pleasant had I got caught under that cloud. Ken's return trip to France apparently went well. I'm sure he'll write about it on his blog. 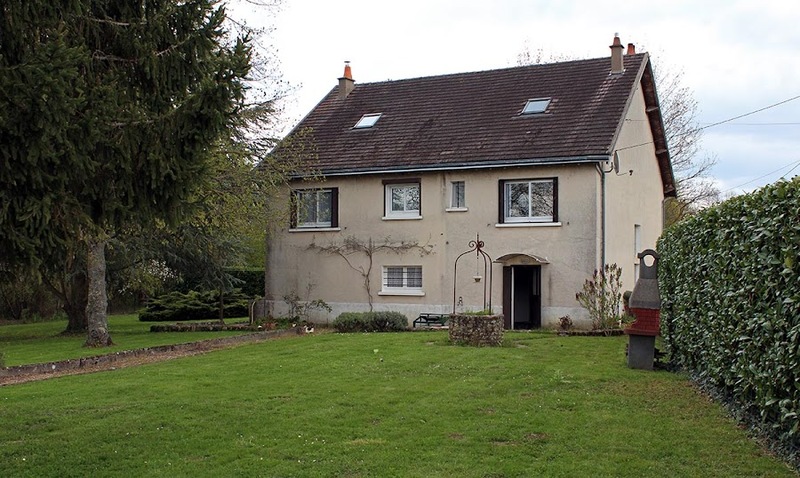 For my part, all I had to to was drive over to Vierzon to pick him up, about 45 minutes from here. it was a very pleasant drive and his train from Paris was essentially on time, just a few minutes behind schedule. Grape hyacinth in our front yard. 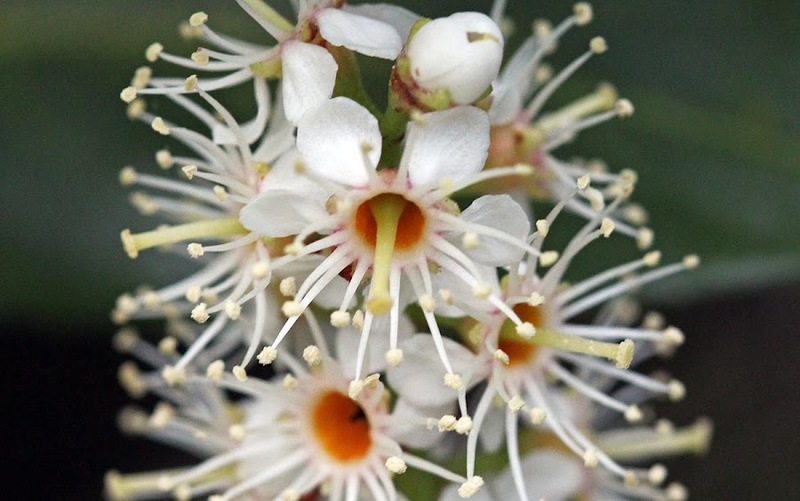 This close-up shows the flowers' white tips quite nicely. The weather people were right; it did cool down. But it's not cold, and when the sun shines it feels fine outside. 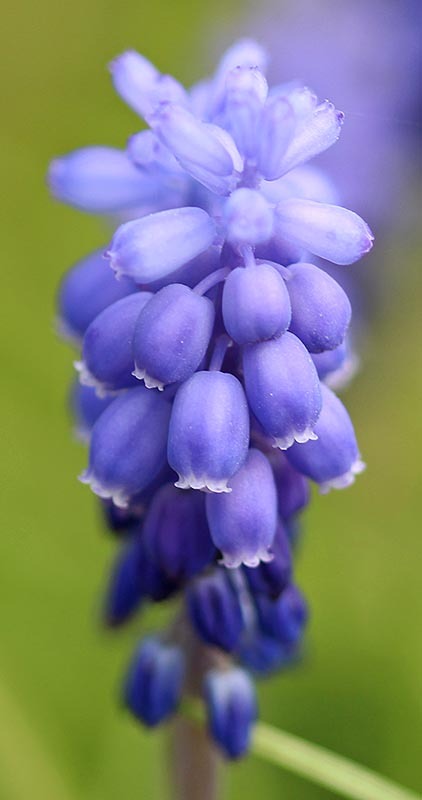 The muscari (grape hyacinth) are looking very nice in the yard now, but they will soon be done and gone to seed. A few years back I transplanted some from the back yard to the patch of grass outside our front door and they're doing very well there. In fact, they're spreading every year. I love garden successes. As I type this, at 6:30 this morning, Ken's plane has landed at Charles de Gaulle Airport in Paris. I got up at six and checked the tracking site on the internet and watched as the plane made its final approach and landed. I last saw the plane at 1:00 this morning as it was just approaching Nova Scotia. Airline contrails above the vineyard behind our house, looking north. You can tell which direction Paris is! So now he'll de-plane, go through immigration and baggage claim, then head toward a train to home. He has several train options depending on how quickly things go, so he'll call me at some point to tell me where and when to pick him up. The river is pretty full right now. Not that you can tell from this picture (it was taken over a week ago). But all the rain we had last week is moving through. Since then, as the temperatures warmed up, the trees have accelerated their flowering and leaf production and things are starting to look more spring-like. 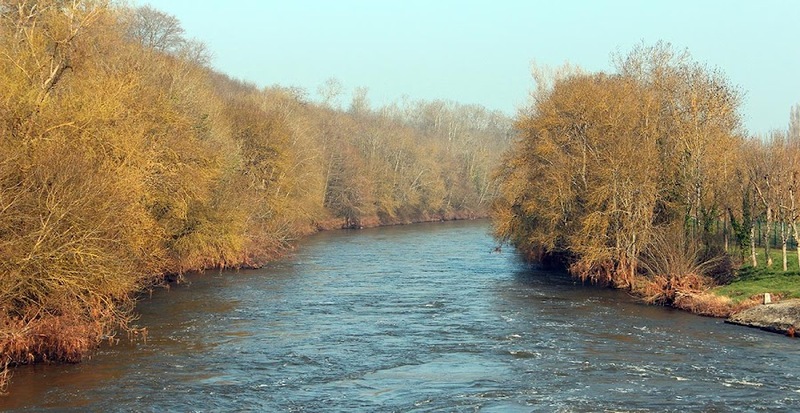 The south branch of the Cher seen from the St.-Aignan-Noyers bridge. The land on the right is the island in the river. Meanwhile, I'm getting the grass cut and the laundry is getting done. Today we're expecting a very warm day, but then the weekend is supposed to be cooler. Not cold, but more seasonable. Can't complain about that. This nice weather is, well, nice. After a quick morning trip to the supermarket (I need some food and wine in the house for when Ken gets back this week), I was able to change the oil and sharpen the blade in the lawnmower. Then I got out the rake and knocked down all the mole hills in the yard. 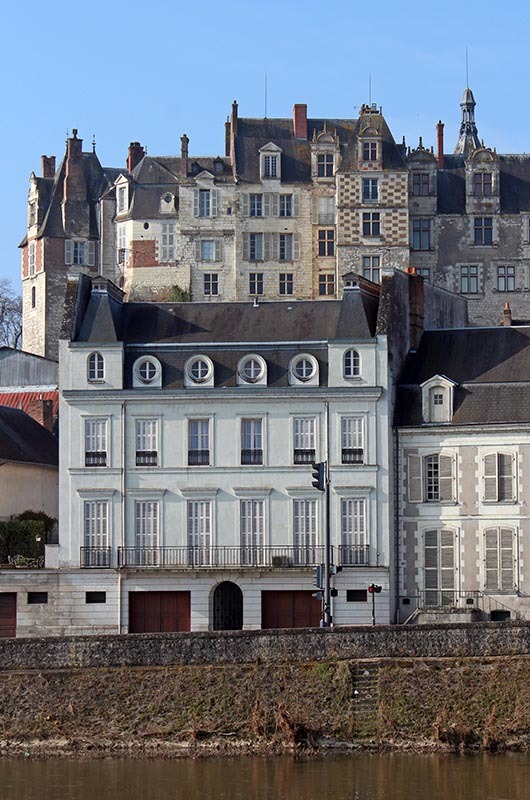 The castle at Saint-Aignan rises above the houses along the riverfront. After lunch I fired up the mower and did about a third of the yard, including the strip along the road outside the hedge. Some of that grass was a foot tall, having grown quickly just as the weather warmed up. Such a sense of accomplishment. Today and maybe tomorrow I'll finish up. 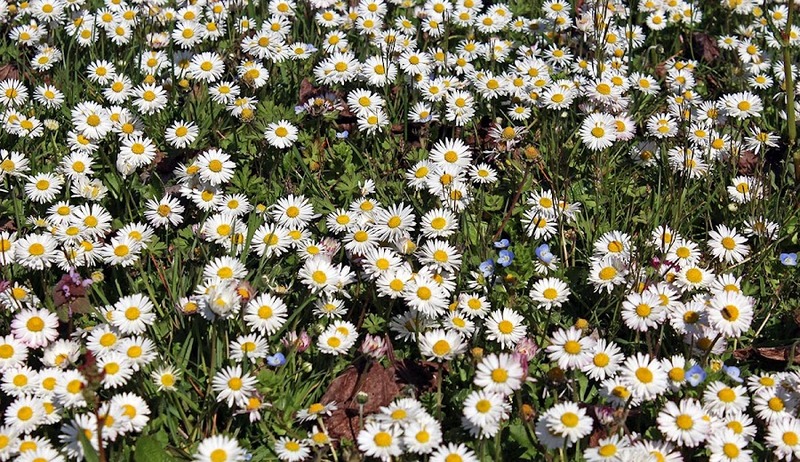 These little daisies are called pâquerettes in French. I suppose it's because they appear around the time of Pâques (Easter). Right now our lawn (!) is filled with them. These, and a few other wild flowers and weeds. Oh, and there's some grass, too. These flowers are so short that most of them survive the lawnmower. Sunday was as glorious a day as we were promised. I had the doors and windows open, I sat out on the deck a lot, and needed nothing more than a t-shirt. This morning is the first morning since last fall that I have not turned on the central heating. I even slept with a window open.Today is not going to be as nice, but it won't be bad, either. Now that the weather is improving I'm able to get on with my list of chores. I've got a ton of laundry (mostly bed clothes) that has backed up because I'm waiting to be able to hang it outdoors to dry. I did some on Friday night and it dried quickly on the line Saturday morning. I'll get a couple more loads done today. 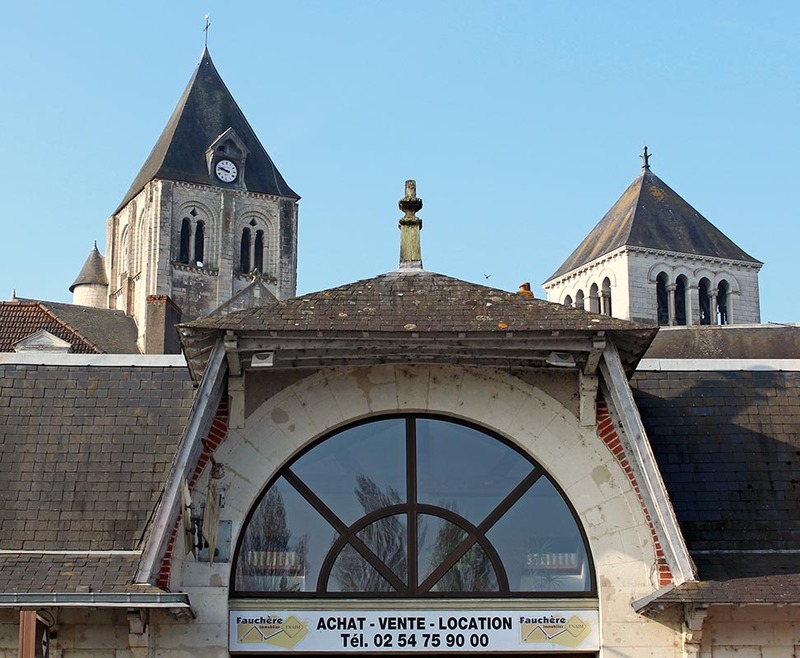 A building on the Saint-Aignan riverfront with the church's towers rising up behind. I got the cold frame assembled and out on the deck and put in my tomato, eggplant, cucumber, and marigold seeds. Another chore I've got is getting the lawnmower ready to go. The grass is growing fast with all the rain and the warming up. I need some motor oil. There are also the living room windows and curtains to work on. I got the big sliding doors in the entry way washed one day last week when we were having alternating sun and showers. I didn't take any pictures of the pie... sorry. 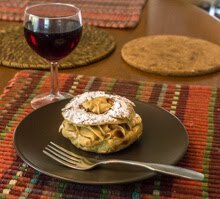 But I did take some shots of the apples while the crust was blind-baking. I made the pie on Tuesday. 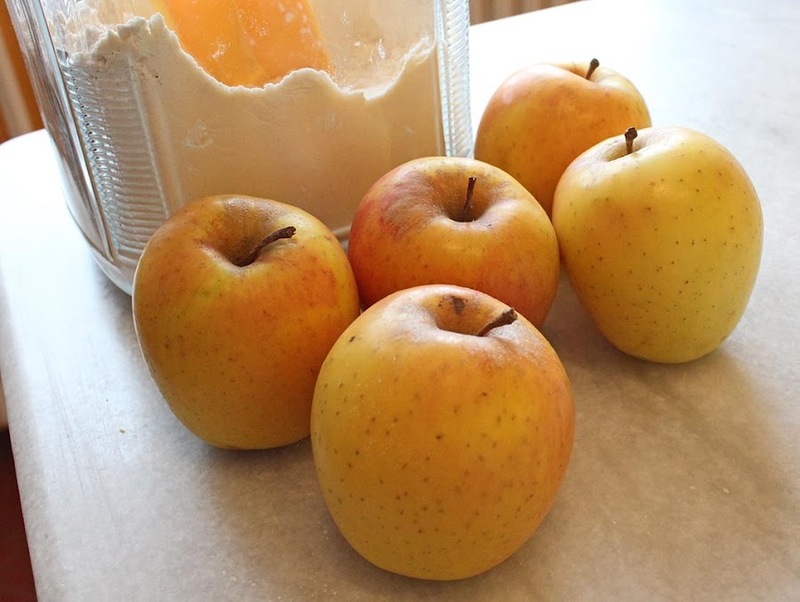 Some apples were already on the stove cooking down to a puree while these waited to be peeled and sliced for the top of the pie. Apples called "delblush tentation," a variety I've only seen recently in our supermarket. It turned out very tasty. Not much time will pass before I make another, I'm sure. Friday's weather was what they call un ciel de traîne, meaning alternating giboulées (showers) and sunny spots. The showers were more like squalls with wind and heavy rain. I had to time Callie's afternoon walk so that we wouldn't get caught in a downpour. On Sunday I used our Kärcher power washer to clean the deck tiles. 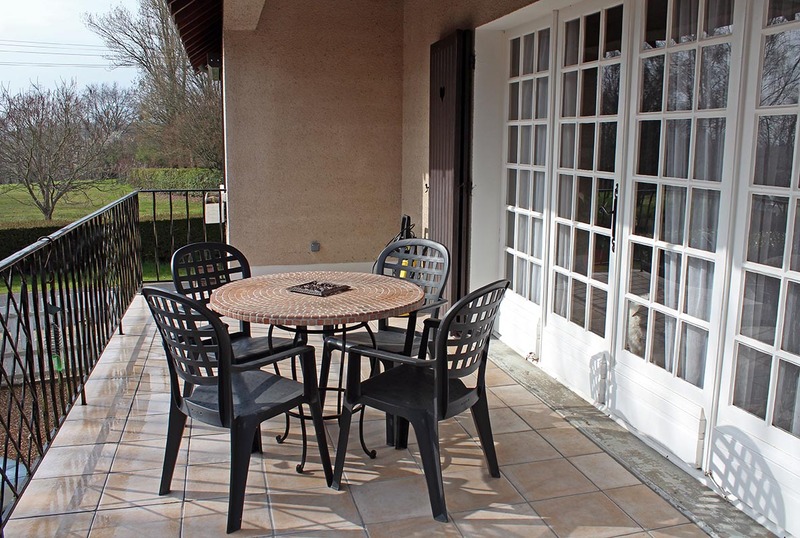 After the summer season and the wet winter, the tiles are caked with dirt and algae. Yuck. So in the spring they need to be cleaned. I used to use a stiff deck brush and a bucket full of detergent. But two years ago we got the power washer, and now cleaning the deck is a breeze. Since I cleaned the deck, it's been raining. There's been a bit of sun, but it's not been warm enough to actually sit outside. Still, I brought up the patio furniture. Sunday is promising to be warm and sunny. Who knows; I may be able to have lunch on the deck for the first time this season. I like this sign on the bridge. 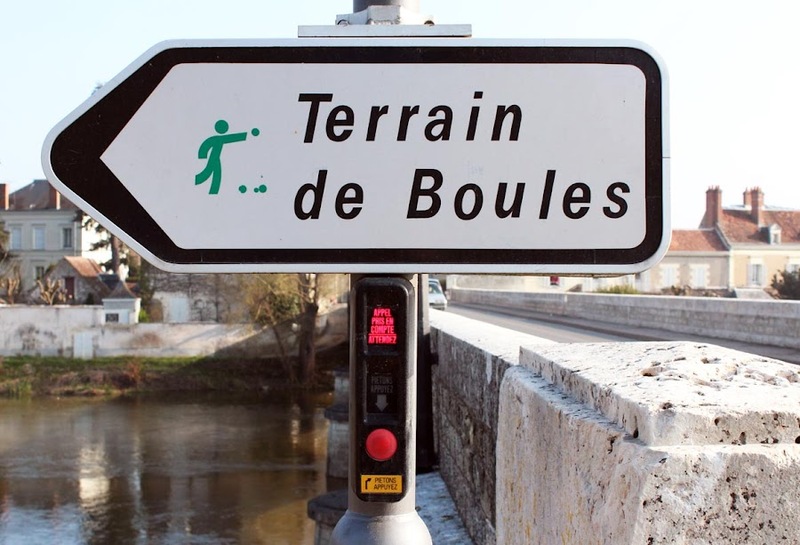 It points toward the western end of the island and a bit of ground that's made for a game of boules, also known as pétanque and similarly, in Italian, bocce. I've only ever played once. It was the first year we lived here at a party hosted by our neighbors across the street. I was asked to join a game. I love the little green man tossing a ball and the other balls at his feet. I know enough to know that if those balls are at his feet, he's not going to win anything. Well, I had had plenty of wine at that point in the afternoon and had no idea how to play, but I had no inhibitions and joined the game. The guys laughed at my foreign lack of skill and more than once told me to just throw the ball "over there," which I did. More laughter. But once or twice I apparently made a good play, although I'm not sure how. At least, that's how I (almost) remember it. After Nazi Germany invaded France in 1940, in the early days of the Second World War, the occupiers divided the country into two zones: Occupied France and Free France. The line separating the two curved in a great arc from the Pyrenees in the south to France's border with Switzerland in the east. The Line of Demarcation followed the Cher River for part of its course. 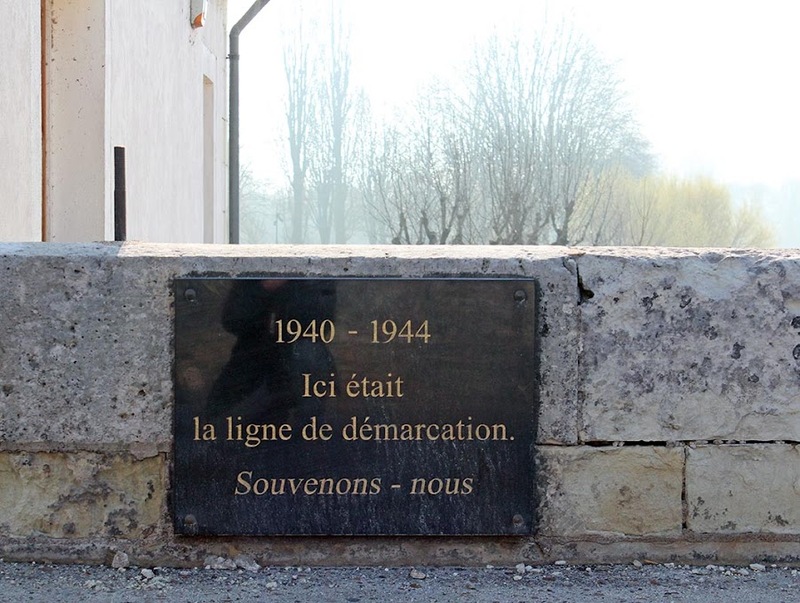 A plaque on the Saint-Aignan bridge memorializes the demarcation line. 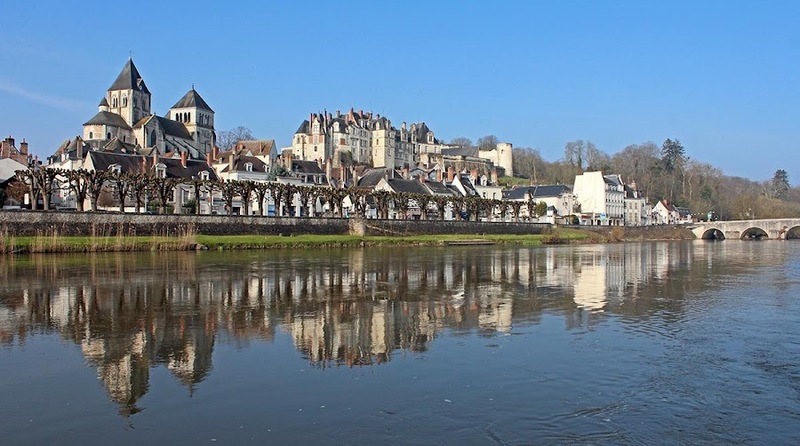 Saint-Aignan was on the free side of the line with Occupied France just across the river. It's hard to imagine what life must have been like here at that time. Ken and I just watched an interesting documentary on television about the line, including interviews with people who lived along it then and their memories of helping to secretly move people across to Free France. The line was dissolved in 1943 after the Nazis moved across the line to effectively occupy the whole of France. This is the southern span of the bridge that crosses the Cher River at Saint-Aignan. It crosses over to an island in the river, then there's another bridge that crosses from the island over to the northern side. This span doubles as a dam. Not long ago, there was a mill on the southern (left in this photo) end of the bridge and the water turned the mill stones. The mill was closed and later burned down. It was demolished in 1974. 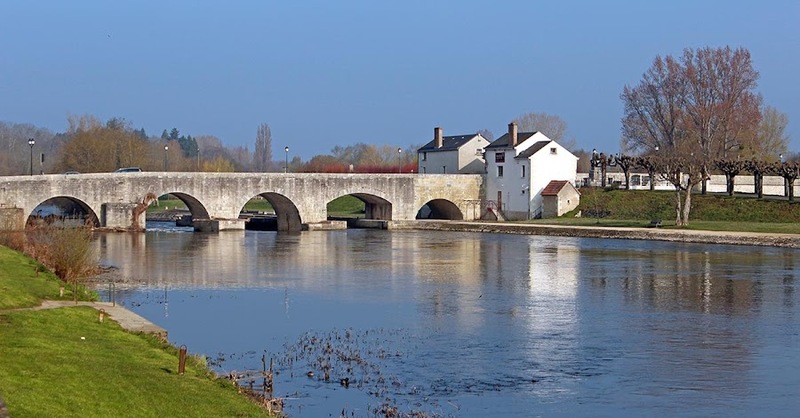 The bridge between Saint-Aignan and Noyers-sur-Cher. The building on the right, this side of the bridge, is a bar and restaurant. On the right side of the bridge under the wide, flattened arch, there is a lock so that boats can move between the upper part of the river and the lower part. I've never seen it used. There isn't much boat traffic on this part of the river these days, unless you count kayaks. Here's a video about the mill. It's in French, but even if you don't understand what's being said, the pictures are pretty cool, especially because it's all about where we live. You may recognize some of the places shown in my photos! Sunday started out beautiful. I woke early and saw the crescent moon rising in the east (I was up before sunrise). Then the sun rose; the sky was clear but hazy. After a while I went over to the supermarket for a few things. I had taken my camera and decided to stop along the river to take some pictures. The church and château at Saint-Aignan on the Cher River. It's where we call home. After parking the car, I made my way along the quai and over the bridge to the island. Then I walked around a bit snapping photos. The sun was making a spectacle of the church and castle. Except for one guy walking his dog, I was the only other person out on the island. It was very nice and I'm glad I did it because by noon the clouds had rolled in again. So Sunday afternoon, I threw caution to the (cold) wind and power-washed the deck. I'm not supposed to use noisy power tools on Sunday afternoons, but I decided to say "what the hey" and did it anyway. My closest neighbors are two doors down and they're indoors in front of their fire. And besides, I heard somebody else's noise over on the next road. And besides, again, it only took about half an hour. So now I can cross another chore off my list. I had some leftover broccoli and a package of duck gizzards that were close to their expiration date, so I decided they would make great ingredients for a quiche. It helped that I have about a dozen eggs just sitting in the fridge wanting to be eaten. 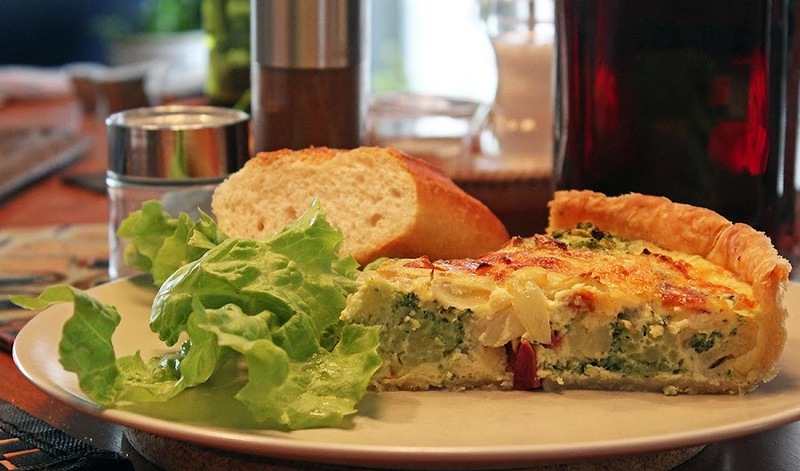 My Saturday lunch: quiche and salad. Yum! So I threw together a crust, sauteed some onions, and grated some cheese. It was a good activity to keep me busy all morning, along with emptying the dishwasher and doing other things in the kitchen. The bread lady has been bringing me a ficelle since Ken's been away. I don't need a whole baguette, so the ficelle (about half the size) works well. It's not the same quality bread as the baguette tradition that we normally get, but it's just fine. It's still darned cold here. Well, not cold if you live in Siberia, or in other polar regions. But our weather feels more like winter than spring. I don't like using more heating oil. Normally the heat goes on for an hour or so in the morning this time of year to take the chill off before the day warms up. But there's not been much warming up and I've had to run the heat longer than I like. Hopefully this week's coming change will set us on the right track. Friday was a cold, wet, gray day. Dreary, gloomy. A real downer. I didn't do much. I balanced the checking account. I made lunch (leftover meatloaf with french fries). I emptied the fryer and loaded the parts into the dishwasher. I poured the used oil into bottles for recycling. Things had begun to dry out, but now it's wet again. 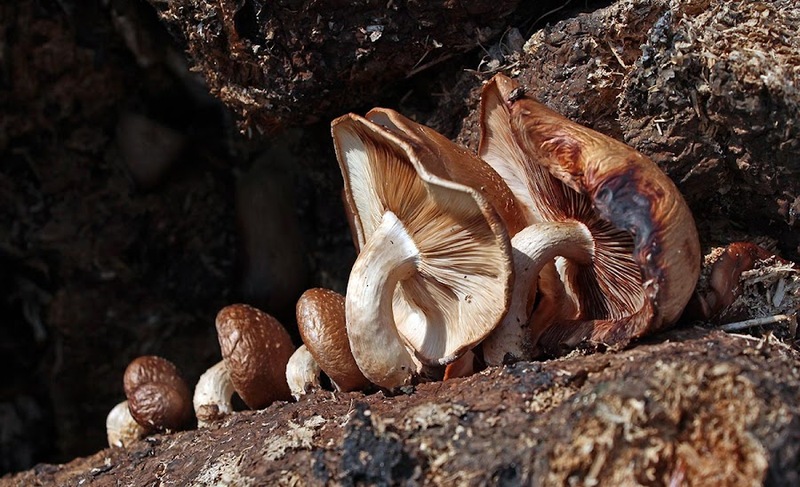 Great mushroom weather. Otherwise, I'm just hanging out, watching television (cooking shows, tennis, documentaries), tooling around on the internet, and walking Callie. Most of the chores on my list are best done in nice weather, and well, we're not having any at the moment. The good news is that the long-range forecast for next week is looking more like spring. Let's hope it's accurate. 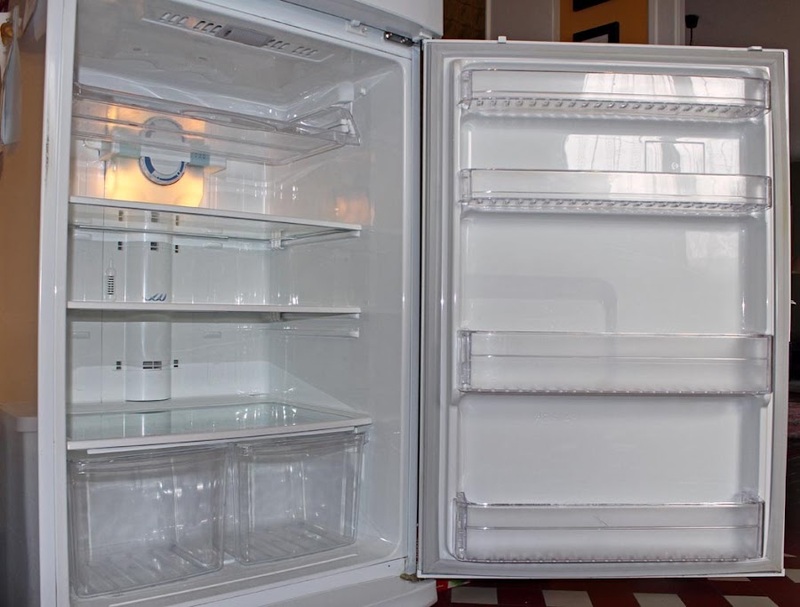 I cleaned the refrigerator. This is only the second time I've taken everything out to clean the inside. The last time I did it was in 2009. The fridge will be ten years old in June. Does that make me bad? Oh, Martha Stewart does not live in this house! Please notice that there is no "before" photo. All the shelves and bins came out for cleaning. Now it looks almost new again. This is one of the many chores I've set up for myself to do while Ken is away. In addition to housework (vacuuming, dusting, doing laundry, etc.). So I feel good about getting this, at least, done. I want to wash windows, but I will wait for better weather. A number of you asked about the web site I used to track Ken's flight on Tuesday. There are a bunch of tracking sites out there, but the one I use most was recommended by a friend a few years ago. And it's been improved lately to include coverage of the US, which it didn't do very well at first. A screen shot of Ken's Tuesday flight over upstate New York. His is the red plane. Click to aeronate. The site is called Flightradar24.com and it's chock full of cool, nerdy features. You can enter the airline and flight number of the plane you want to follow and it will highlight that flight, or you can just click on a random plane to follow it. You can also filter to see only the flights of a particular airline, or see only the flights that use a particular aircraft. And on and on. It's a live view and the planes move across the screen in real time. In the screenshot above, you can see Ken's flight (US Airways #787) highlighted in red, with the path (that traces the route all the way back to Paris) behind it in purple. The sidebar on the left gives some details about the flight along with a sample photo of the aircraft. 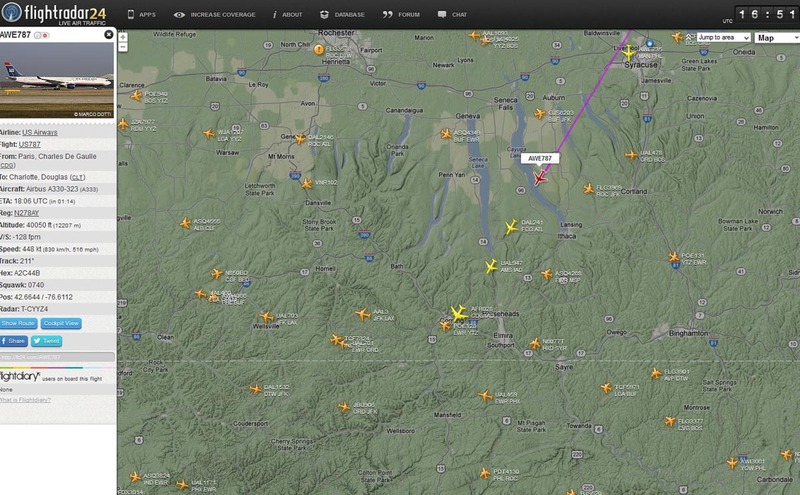 You can clearly see how Ken's plane is fourth in a line of international flights over New York's Finger Lakes. Each plane is identified by call sign and origin/destination codes (settings that I selected). The plane just in front of Ken's is a Delta flight from Rome to Atlanta. It's following a United Airlines flight from Amsterdam to Washington Dulles, and the big plane in front is an Air France flight from Paris to Washington Dulles (it's a big double-deck Airbus A-380). The site offers an option to download Google Earth to work with what they call the "cockpit view" that simulates the view from the plane using Google's map and satellite imagery. That's a lot of fun. You can zoom in and out around the world and watch the planes go by. I've even used the site to identify the jets I see going over our house. 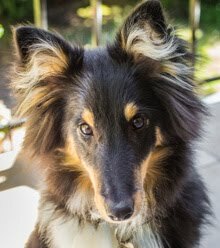 Flightrader24.com is a great site and I highly recommend it! Here's the Cal-gal out on the vineyard road the other morning. She actually turned to look at me when I had the camera ready. 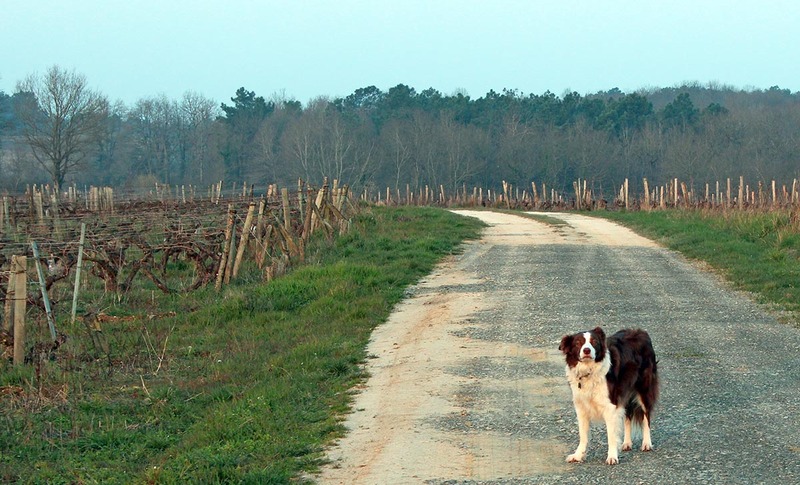 Callie at sunrise on the vineyard road. Ken is now in North Carolina. If you read his blog you are up to date. I tracked his flights on the internet. That's so cool. One of the sites I use has what they call a "cockpit view" that uses Google Earth to simulate what the pilots see out the cockpit window. That was a lot of fun to watch as Ken's plane headed out of Paris toward southern England. I will be working on my list of chores over the next couple of weeks. I've already crossed a thing or two off the list! Ken had a ticket on a train out of Blois at 11:57 Monday morning. The best laid plans. When we arrived at the station about a half-hour before departure, there were trains posted as late on the board. Ken's was listed as on time, but after about five minutes that changed to late, too. There's Ken pulling his suitcase along toward the Blois train station. 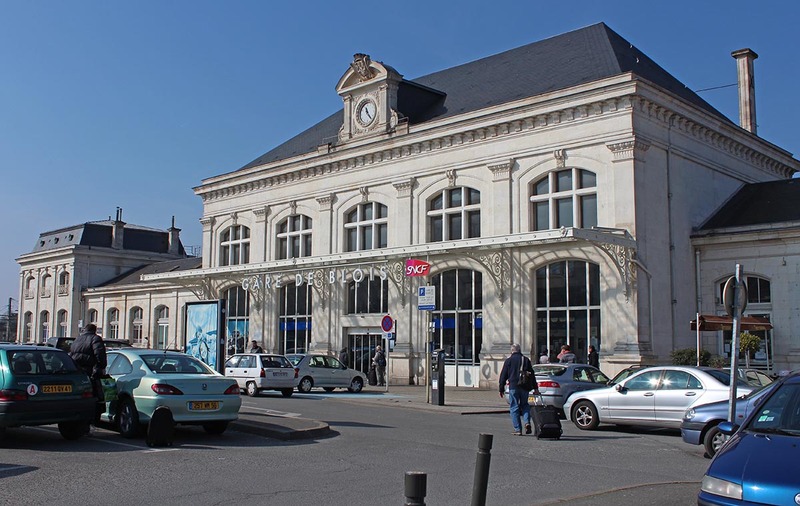 The station personnel made an announcement that people going to Paris should get on the train going to Orléans, leaving imminently, and then change to a Paris train there. We hurried out to the platform to find the train and someone to ask. Things were a little (but not too much) confused on the platform. Ken's train pulls out of the station. 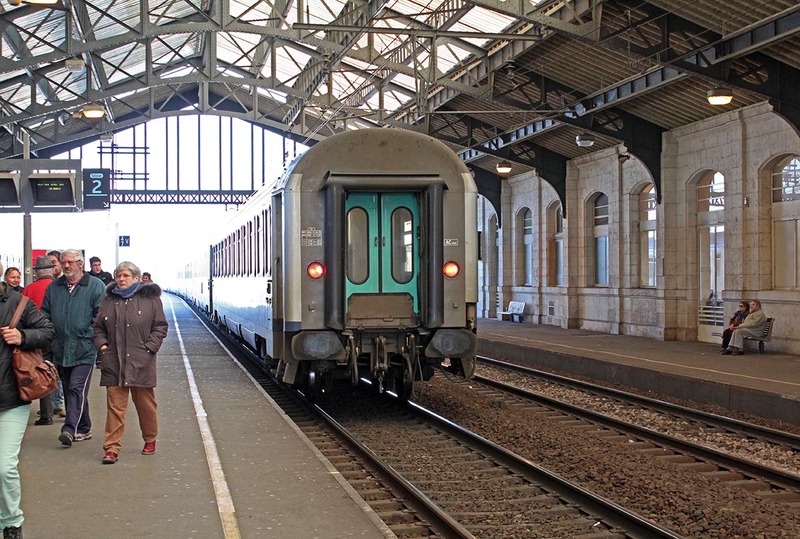 He had to change trains in Orléans, about a 45 minute ride up the river from Blois. Ken verified with an agent that he could board this train with the (non-refundable, non-alterable) ticket he had. So he did. He found a seat and we waited (me out on the platform) for the train to pull away. It left about fifteen minutes late, but fifteen minutes before his scheduled train would have left. 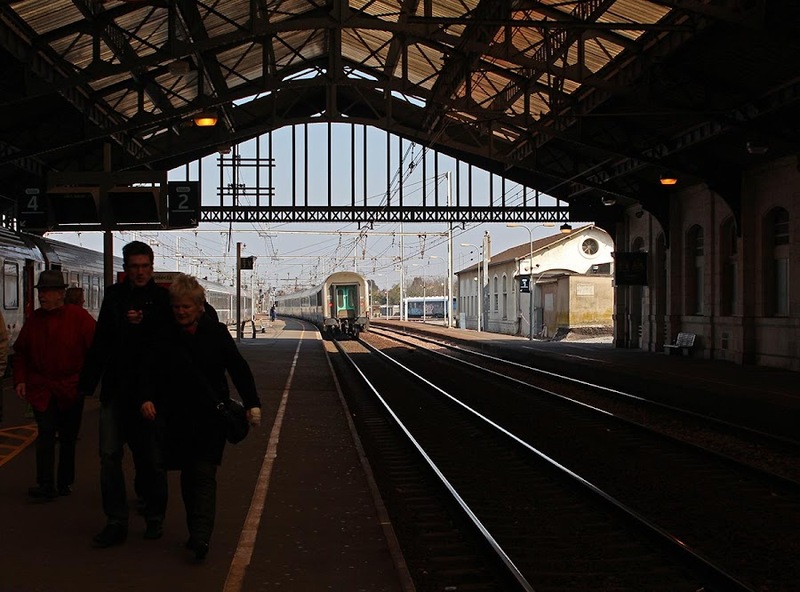 He called me from Orléans to say that things there were a mess; there was a problem on the line between Orléans and Paris, and he might have to wait an hour or two before a train could leave. The staff served little boxed lunches to people waiting. This is a good reason for not trying to take a train to the airport on the day of departure. Ken was not in a hurry and not in danger of missing his plane. He got the first train out to Paris then on to the airport and to his hotel without having to stress about making the flight. He'll probably blog about it when he gets a chance. I'll be tracking his flight which is scheduled to take off later this morning. Ken leaves today for a trip to the US. He'll be visiting his mom and other family members for a couple of weeks. That leaves me, Callie, and Bert at home. I should get a little more exercise than normal with two walks a day while Ken's gone. 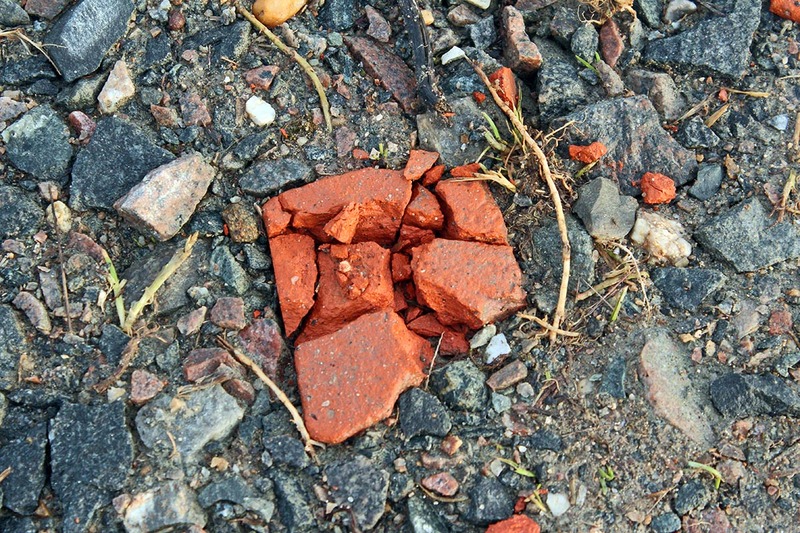 A bit of brick embedded in the vineyard road. I have a whole list of chores I want to get done, but some of them require a bit of warm weather. The forecast is not great, but we'll see how it goes. At least we're having some sun now.